While I enjoy a variety of music including pop, rock, classical, and jazz . . . country music is my favorite . 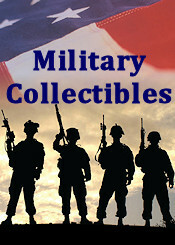 . . with a special fondness for songs about America, the troops, and veterans. Nor is there a better place to experience country music and its history than Nashville, TN, which I did with my wife and 14-year-old grandson earlier this month. And what an enjoyable and informative visit it was! We even came across patriot and music legend Charlie Daniels' museum just off Broadway near Riverfront Park, where outdoor concerts occur. We also discovered that a stroll across the nearby Shelby St Pedestrian Bridge is ideal to view Riverfront Park along with much of downtown Nashville and UP Field (stadium). It is a picturesque scene with the Cumberland River flowing underneath the bridge. Then just a few blocks further west is the Country Music Hall of Fame and Museum and the Musicians Hall of Fame and Museum, which are both must visits. The Country Music Hall of Fame and Museum was a unique experience for my wife and me . . . and even impressed our grandson, who really liked the large wall displays of the gold and platinum records of the artists (photo left) including those of Elvis Presley. Surprisingly, my grandson, who is more into other types of music, showed similar interest in many of the other Country Music Hall of Fame and Museum displays including many questions about them! 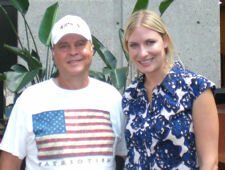 Holly Williams (daughter of Hank Williams, Jr.) after we saw her interviewed by Michael McCall with Country Music Hall of Fame and Museum. Holly also performed several songs written by her, which were very moving and should be heard by all . . . Could the next great Williams in country music be a woman named Holly? 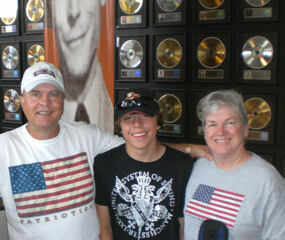 Our next tour was at the Musicians Hall of Fame and Museum. And while not as large as the Country Music Hall of Fame and Museum, it has displays honoring artists from many music genres. 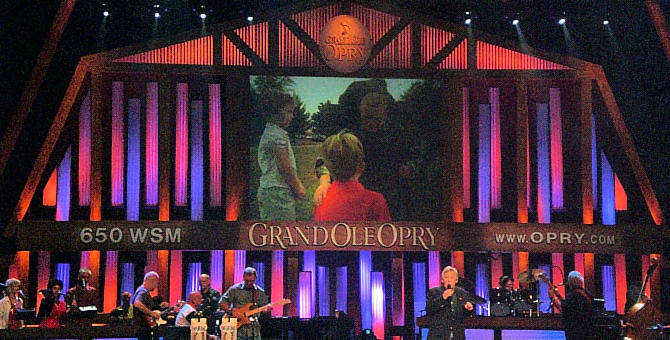 Now, I have to admit that attending the Grand Ole Opry show on July 4th was the primary reason for coming to Nashville . . . as it epitomizes what country music is all about . . . and has done so with every show during its illustrious history. In fact, the July 4th show was even more entertaining than my wife and I had anticipated. Even my grandson thought it was “awesome” and came away a true country music fan. Another nice surprise was hearing rising star, Chris Young, perform his new hit song, "Gettin' You Home". Chris was a winner of Nashville Star a few years ago . . . and "really appealed" to the females including my wife. He is also one of my favorite country music stars. There was even a very special 50th anniversary performance by The Browns (Jim Ed, Bonnie, and Maxine) of their 1959 hit, “The Three Bells” . . . which sold over a million copies and was the first number one country song ever to cross over to number one on the pop and rhythm & blues charts as well. They received a very deserving standing ovation. 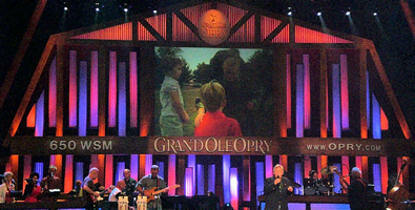 It was a truly memorable night at the Grand Ole Opry. Another must when visiting Nashville . . . is experiencing The Hermitage, where Andrew Jackson lived before and after his two terms as the fifth President of the United States of America. 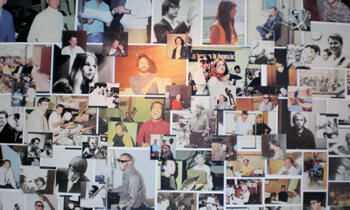 Almost everything in the home is how it was at his death. You can also walk the grounds including a lovely garden where his tomb is located. Moreover, there is a very informative short film about the life of this great heroic leader from his childhood through his presidency. My wife and I learned many new interesting facts and a better understanding of the man, Andrew Jackson. 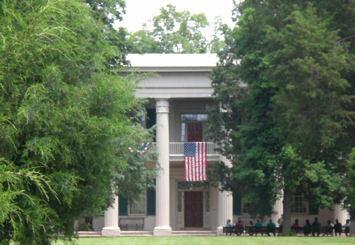 My grandson now knows more about Andrew Jackson than his grandparents did before visiting The Hermitage. I encourage fellow patriots to experience Nashville at least once even if you are not a country music fan. My wife and I plan to do so again, as we want to do more of the same . . . and enjoy other Nashville flavors we were unable to do this time.